Scientists like to refer this as “climate change” but whatever it is called, it is real, it is worldwide and the consequences of ignoring it or belittling it, are very serious. I was blown away when I saw this graph on the front page of the New York Times, on February 7, 2019. I mean the front page of the New York Times is precious territory, but the editors decided to put this graph at the top left corner, because it tells a very compelling story. 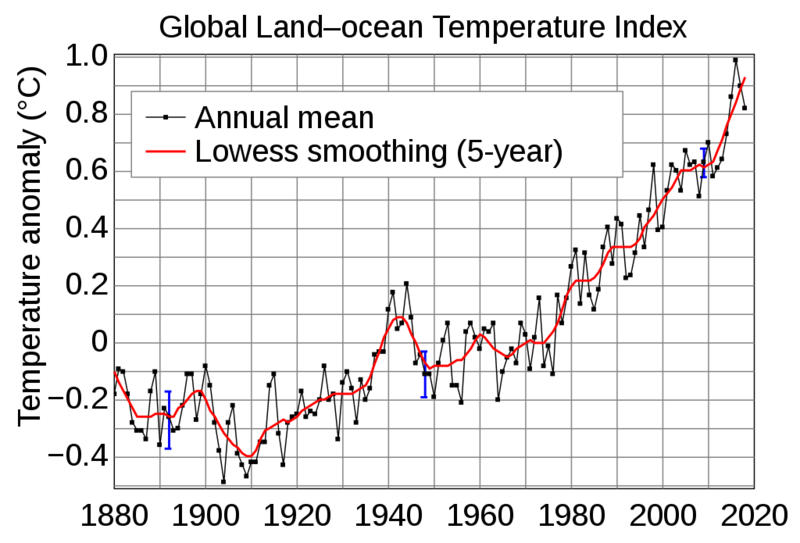 It is from the National Oceanic and Atmospheric Agency (NOAA) showing the 2018 global temperature is right on trend beginning around 1970. Look at the last five points, 2014 to 2018, the temperatures are above all others on the chart, meaning the last 5 years were the hottest ever on our planet. This temperature increase coincides with increases in worldwide carbon emissions. It is distinctly different from the 1880 to 1930’s, random ups and downs. Global warming is a factor in extreme weather events including the blistering cold snap in the Midwest, the extreme heat wave in Australia, hurricanes in Puerto Rico, Florida, and the gulf coast states, prolong dry conditions in California promoting forest fires and expansion of deserts causing famine in Africa. It is real, It is bad, And we lack leadership at the highest levels of our government. Trump will pull out of Paris Accords, and did not say one word about climate change in the State of the Union address. I’ve said this before, and I’ll say it again. Global warming doesn’t cause hurricanes to form. Ok. It is a contributing factor in turning a tropical storm into a hurricane. I live in Miami, and I know the difference. Hurricanes can totally destroy a house and are deadly. I was in Miami when Hurricane Andrew hit in August 1992 and I saw the destruction. Challenges from urbanization and migration will persist, while the effects of air pollution,inadequate water, and climate change on human health and livelihood will become more noticeable. Domestic policy responses to such issues will become more difficult—especially for democracies—as public become less trusting of authoritative information sources. The report does not go into detailed as this is a highly condensed summary of immediate threats to the US. It is clear from the report that water and food shortages increase the risk of unrest in parts of the world. I fear these trouble spots will end up like Syria and Libya, prolong proxy wars. President Obama was ridiculed on Fox News suggesting that climate change could be a worse peril than terrorism to our country. Our increasing environment problems becomes more noticeable – that’s right, if we take the trouble to see what’s happening. Of course, when a hurricane comes and demolishes your dream beachfront home, it is pretty difficult to ignore. Just as I was ready to hit the publish button, I discovered another news story, in which scientists consider our warming gulf coast waters make it likely that hurricanes will intensify at a more rapid rate (see Miami Herald story). This gives everyone less time to evacuate, and is particularly bad for the less mobile (poor people, elderly, hospitalized folks) to get out of harm’s way. To reiterate, it was great to see the New York Times break out of the publishing norms, and put the graph front and center. Of course, they followed up with pictures of melting glaciers in China, wildfires in Paradise, California, Hurricane Florence in Florida, and a dried up section of the Rhine in Germany. All of these were from 2018. And they put it all online so anyone could read their story. Great work. But, there is more needed than just public awareness. Why Is the Cold Weather So Extreme if the Earth Is Warming?